If you can’t see three polar bears in our cover image, look again. 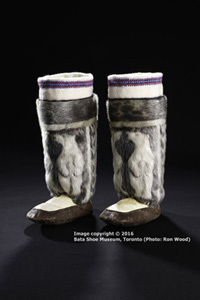 This pair of sealskin boots from the Bata Shoe Museum’s current Arctic exhibition is decorated with different varieties of furs, an amazing achievement considering the thickness of the material and the necessity to perfectly match the natural colours. Then there’s the nap which must be in the same direction, horizontal for women, vertical for men. 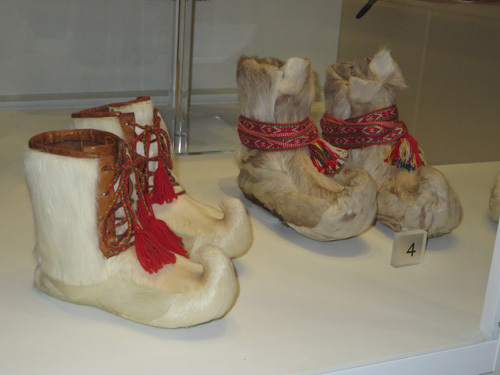 These 1987 boots are part of an exhibition of footwear and other relics from the polar regions that include Siberia, Alaska, Canada, Greenland, and Sápmi (northern Scandinavia). Like our famous Inuit carvings, they illustrate the sense of beauty humans have in spite of harsh living conditions. 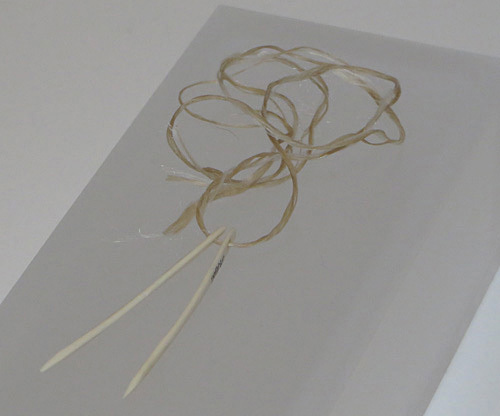 At the museum’s convenient location near the St. George subway station, you can find fish bone needles that resourceful women threaded with sinew from dried animal tendon before the introduction of steel needles. These bone needles were so valuable that women kept them in highly decorated cases which you can see in this museum. 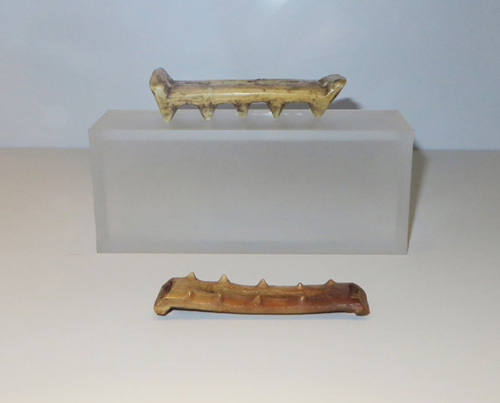 Look for these carved ivory crampons used in Siberia which gave people traction in the snow and ice, long before Yaktraxs. Keeping dry and warm was and is most important in the northern climate. 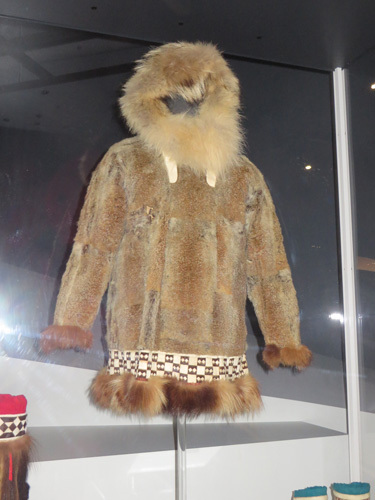 In the old days, some people used eider duck feathers or grass inside fur boots but look for this special man’s parka made from at least 50 squirrels, a prestige piece. Embellishments were important especially as the cultures developed and made contact with the outside world. 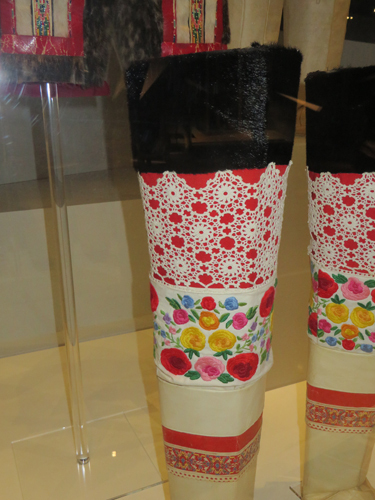 Sami national boots are decorated with imported lace and silk and are thigh-high, practical and beautiful too. Cute are the typical upturned toes of some Sami boots. They could inspire a new style here down south, no? They were designed to make it easier to tie on skis. These tiny pieces of dyed sealskin, skillfully appliquéd on fabric, look like embroidery. They are a tradition in Greenland. How these people survived the elements with minimal resources and yet maintained a high standard of beauty should be an inspiration to us. I haven’t found any Inuit festivals we can attend in Toronto though performances here by the amazing Inuit throat singer Tanya Tagaq have made up for that in spades. We don’t have very many Inuit people living in Toronto. So this exhibition will add to our opportunity to experience Arctic cultures in addition to the permanent Museum of Inuit Art in Queen’s Quay Terminal which showcases Inuit sculpture and prints. For more information about the Bata’s exhibit, see: http://bit.ly/1R57zj3. Individual admission fee: $8-$14. Family packages available. Thursday evenings from 5-8pm are Pay What You Can with a suggested donation of $5. Please let us know what you find interesting. While you are at the Bata, you might also want to see a second exhibition: The Curious History of Men in Heels. It’s as fascinating as it sounds. Did you have a hand in finding any of these amazing boots, Ruth? Sorry, I wish I did as I’ve always wanted to visit northern Scandinavia. I expect the exhibition will still be on the next time you visit Toronto. The museum is worth a special visit to the city. Ruth. We have to work together again. Many thanks for your encouraging words. 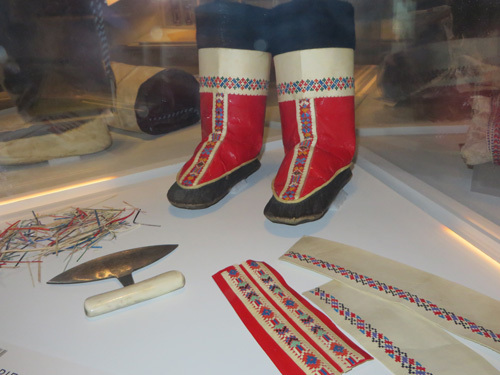 The Arctic exhibit at the Bata Shoe Museum was wonderful.